Maharani Sita Devi Sahib of Baroda, born May 12, 1917 in Madras, India, died February 15, 1989 in Paris, France. She was known as the “Indian Wallis Simpson”. She was a colorful lady who led an extravagant life for over 40 years and was a member of the international jet set. The Maharani was the daughter of the Maharaja of Pithapuram – Sri Raja Rao Venkata Kumara Mahipati Surya Rau Bahadur Garu and his wife Sri Rani Chinnamamba Devi of Mirzapuram. Sita Devi first married M.R.Apparao Bahadur, Zamindar of Vayyur. By him she had one child Rajah M.Viduth Kumar Apparao. She met her second husband, Pratap Singh Gaekwar of Baroda, at the Madras horse races in 1943. The Gaekwad was, at that time, considered the eight richest man in world. It was also reported he was the second richest Indian prince. The Gaekwad was mesmerised by Sita Devi. The lovers consulted with his legal team. The lawyers recommended that the Hindu Sita Devi convert to Mohammedanism. That would dissolve her marriage to the Zamindar under Indian law. She embraced Islam only to then adopt Hinduism once again. The Gaekwad took her as his second wife, which caused consternation with the British authorities, as this violated the antibigamy laws that the previous Gaekwad of Baroda enacted. The British Viceroy in New Delhi summoned the Gaekwad to contest this marriage. The latter argued that the law applied to the subjects of Baroda, and that he being their monarch was exempt from this law. This was confirmed by the Viceroy’s legal advice. The British government accepted the marriage, but didn’t refer to the Maharani as “her highness” as was the protocol for the princely states. In 1946, the Gaekwad took his second wife on a tour of Europe. The reason for their visit was to find a suitable residence away from India,. They found that the independent principality of Monaco was a suitable place to set up their second home. They bought a mansion in Monte Carlo and the Maharani took up permanent residence. The Gaekwad visited often, bringing some of the great treasures of Baroda to Monaco. The Maharani became the custodian of these treasures. The couple also made two trips to the United States after the war. They went on a spending spree, buying all types of luxurious items. It was widely reported they spent $10 million on one of those trips. Indian officials audited the principality’s finances. They concluded the Gaekwad had taken several large interest-free loans from the Baroda treasury. They demanded it be returned. The prince complied by making several payments from his $8 million-a-year income. The princely couple transferred a copious amount from the Baroda treasury, including some of its most famous jewelry, including four celebrated pearl carpets, a famed seven-strand necklace of priceless pearls (called the Baroda pearls), a three-strand diamond necklace with the famous Pink Brazilian Star of the South 128.80-carat (25.76 g) diamond and the English Dresden 78.53-carat (15.71 g) diamond. The princely couple also had custody of the Empress Eugenie. When Baroda was integrated into the newly independent India,Indian officials were eventually able to recover some of the items, but some of the jewels had been transferred to the Maharani’s ownership. Years after the Maharani’s death some of the precious items were discovered. In 1994 the pearl carpet were found in a Geneva vault. It was sold to an Arab prince for $31 million. Currently this carpet is displayed at the Museum of Islamic Art at Doha, Qatar, even though it was commissioned by an Indian Hindu Maharaja and not any Islamic ruler. The Star of the South and other gems were located with jewellers in Amsterdam. Eventually, India, due to the discrepancies and possible fraud, deposed the Gaekwad in 1951 and his eldest son by his first wife succeeded him. Technically, the couple were not heads of state any longer, but they insisted on still being referred by their former titles. She gave the Gaekwad one son, born in 1945, his name was Sayaji Rao Gaekwad. Nicknamed “Princie”, he was the apple of her eye. She attended some of the most exclusive events on the globe and partied with other international luminaries, i.e. Aristotle Onassis. 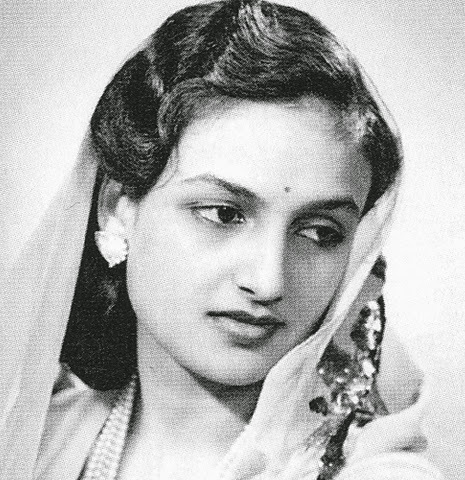 In 1953 the Maharani sold a pair of bejeweled anklets to Harry Winston. They had several large emeralds and diamonds. The jeweller set these stones into a spectacular necklace that was bought by the Duchess of Windsor Wallace Simpson. The Duchess wore this to a 1957 New York ball also attended by Sita Devi. When other guests were admiring the necklace. The Maharani was heard to exclaim that those jewels looked just as nice on her feet. The embarrassed Duchess returned the necklace to Winston. The Maharani was a car enthusiast and was reportedly very fond of her Mercedes W126, which was custom made for her by Mercedes-Benz. At the 1969 Ascot Gold Cup she invited guests to touch the 30-carat (6.0 g) sapphire on her right hand for good luck. Esquire Magazine included Sita Devi and Princie on its list of “fun couples” for 1969. Sita Devi divorced the Gaekwad in 1956. He promptly moved to London. Even after the dissolution of her second marriage, she clung to her exalted title. Her Rolls-Royce still sported the armorial insignia of Baroda. She would reminisce about the days when she was referred to as royalty and received 101-gun salutes. Prince Rainier awarded citizenship of Monaco to both Sita Devi and Princie. She maintained a Paris apartment as well. She continued to live in grand style, drinking Baron de Rothschild’s Bordeaux, rearranging her Louis XVI furniture and attending exclusive parties. When travelling she brought along a large wardrobe, reported to be a thousand saris, hundreds of pairs of shoes and of course her jewellery. But her finances were eventually exhausted enough for her to secretly auction some of her beloved jewels in 1974. The Maharani suffered a tragedy in 1985, when Princie committed suicide one night when after his 40th birthday. His death was attributed to alcoholism and drug addiction. Sita Devi died four years later of natural causes. Some speculated it was due to a broken heart.